Qugo is a free smartphone messaging app that allows you to express beyond text and stickers using your own 3D animated avatar. 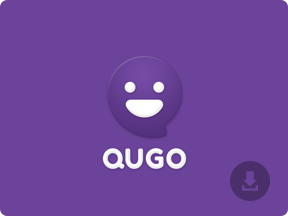 Qugo puts the emotions in emojis, giving you your very own custom 3D avatar to express yourself in free chat rooms. You can even chat with voice and photos! In this Refer and earn program you can get Rs.100 free recharge once you successfully refer 5 friends and get Rs.500 Amazon voucher after referring 30 friends. 1. Download Qugo App from Here . 2. Now, open the App and verify your Phone number. 3. After successful verification, click on Home button and go to Follow Channels then follow "QUGOstar". 4. Now, click on profile button & select "Text Invite" to invite your friends. 5. You can View your referral count from Settings > ­­ My Referral count section. You need to refer at least 5 friends to get Rs.100 Free Recharge. Refer 30 friends & get Amazon voucher worth Rs.500.